There is currently no version of LackeyCCG that runs natively on Linux, however LackeyCCG seems to run well on Linux using WINE. For those that don't know, WINE is software that you can run on Linux to let you run Windows programs. 1. Download and install WINE. 2. In the terminal, type "winetricks vcrun2008" and install that. 3. Download and install the latest version of LackeyCCG for Windows from the downloads page. 4. 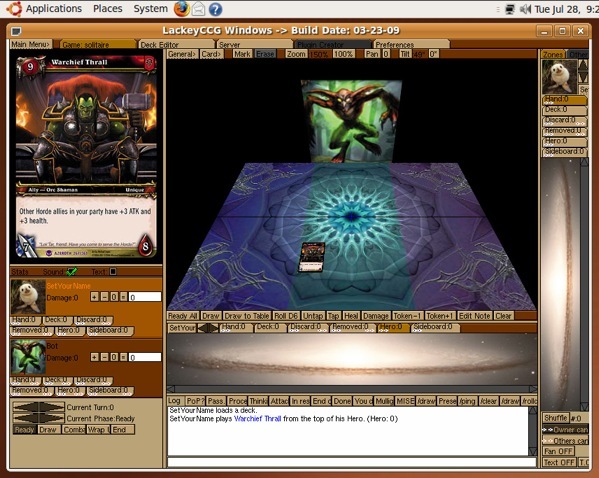 Watch the LackeyCCG video tutorials on installing LackeyCCG and card plugins for LackeyCCG. On 7/28/09, I was running the Ubuntu (v9.04) version of Linux, and I downloaded WINE (v1.0.1). I downloaded and ran LackeyCCG and it ran well. I have not tested any other versions. If you experience any problem running LackeyCCG, please post in the LackeyCCG forum. If you experience problems installing WINE, please refer to the online documention about WINE. There is plans for a native version of LackeyCCG on Linux, but right now other things are being worked on, like adding new features and fixing bugs. But until then, using LackeyCCG through WINE should work.